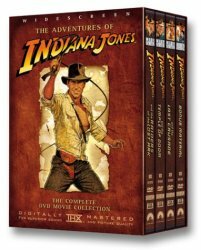 "From Brazil to Bangkok, from the Ark of the Covenant to the Temple of Doom, INDIANA JONES and his companions blaze a trail of adventure and mystery! Now you can be part of the action too! 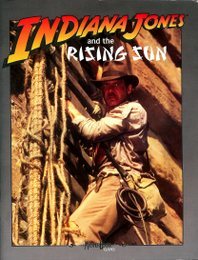 Wether you play the part of Indy or one of his trusted friends, you'll be right in the middle of all the danger and excitement. You could be searching lost ruins for fabulous treasures, recovering stolen artifacts from foul Nazis, or racing through jungles to escape from hostile natives. 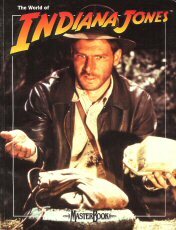 Can INDIANA JONES survive? It's up to you!" • a Referee's Screen, which features tables and Adventure Backdrops." This adventure pack contains Referee notes and player information... 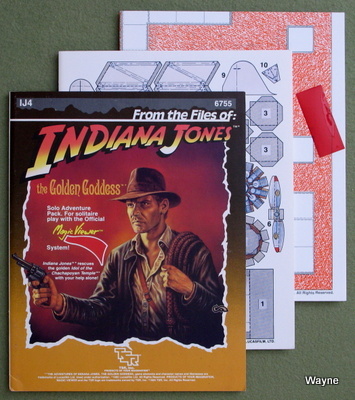 Included is a poster map of the adventure areas illustrated with photographs from the film and an Evidence File with photos and other information for the players." "The stakes are higher than ever before! The Nazis are closing in on the world's holiest artifact, and you've got to get it before it's too late. Can you reach the Ark before your archrival Belloq does? Can you escape before the foul Nazi Toht practices his deadly craft on you? Can you get a minute to breathe?? You make the choices and create the adventure in Indiana Jones's most dangerous mission: recovering the Lost Ark of the Covenant." Magic Viewer solo module. 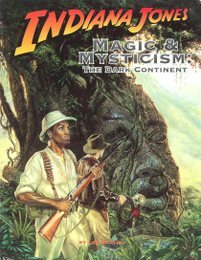 "From the French countryside to the steaming heart of Africa, Indy sets out on a fantastic adventure that tests his skills... The Crystal Death adventure module can be played as a standard group adventure or as a special duel" between the referee and one player. Magic Viewer solo module. Indiana Jones rescues the golden Idol of the Chachapoyan Temple "The darkness is almost complete around Indiana Jones. Almost. Robed shadows lurk menacingly... and they have the Idol, the Golden Goddess! Saad Hassim, owner of the biggest antiquities shop in Marrakesh, sure is getting lots of late business tonight! Indiana Jones, never slow to regain his own, springs into action! How? 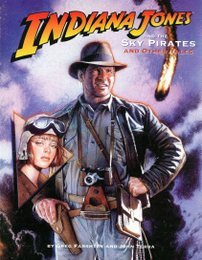 From Marrakesh rooftops to New York City skyscrapers, Indy tries desperately to capture the Idol lost so long ago to that villain Belloq..." A Solo Adventure. 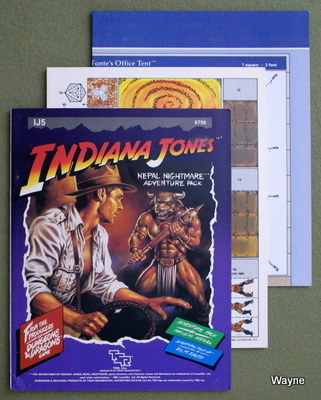 The product features the colorful Adventure fold-up Deathtrap... Also included is a full-sized poster map of the adventure areas." "The Fourth Nail -- truth or legend? Indiana Jones will not stop until the facts are known." Also included are a second referee screen with new weapons, vehicles and animals. A combat computer you assemble, to speed your adventures along. Ruin maps and a random ruin generation system to create your own havens of antiquity..."
West End Games also took a stab at IJ. It was incorporated into their MasterBook game system. 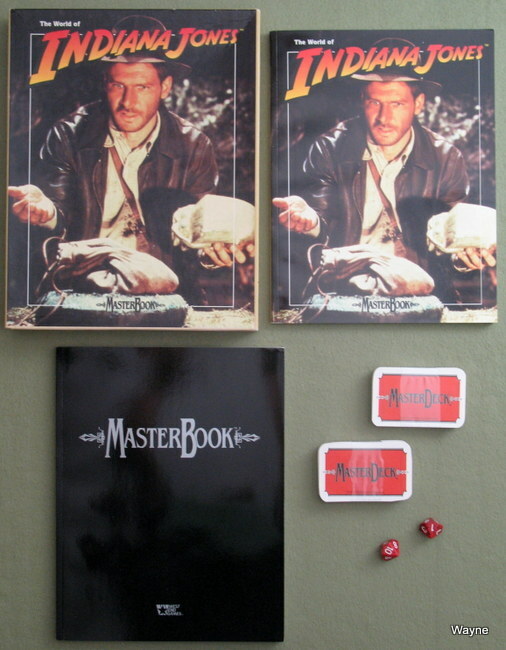 The box set contains: Indiana Jones Worldbook, the MasterBook rule book, and the MasterDeck card set. "Now you can travel to exotic lands, challenge ancient mysteries and brave dangers beyond imagining. Plunge into a world of treacherous spies, thrilling chases, arcane artifacts and non-stop excitement with the greatest hero of them all! 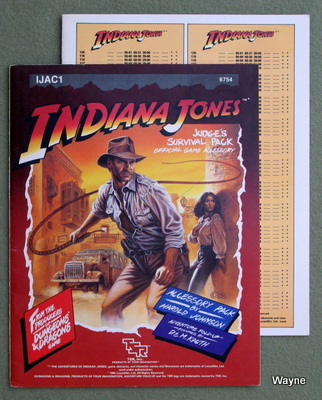 The World of Indiana Jones gives you everything you need to begin your adventuring career. Learn how to create a character and the allies and enemies he's likely to encounter in his travels. 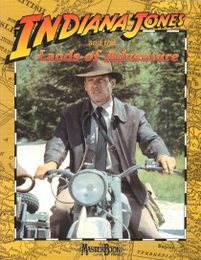 Then get ready for the ride of your life with an Indy mini-adventure!" 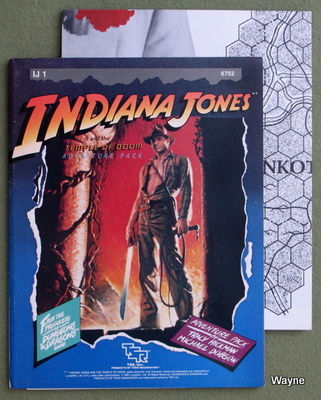 Stapled in the centerfold are a pair of 2-panel ref screens. (Why weren't they in the box set?) A must-have for the GM. "Japan, the 1930's: A place of danger, mystery and adventure. Hidden temples house mysterious artifacts, ancient beliefs clash with modern culture, and dark forces prepare to plunge the island nation into war. Travel to this strange and exotic land and learn its many secrets. Confront the power of the military; delve into the puzzles of the priesthood; and then enter the twilight world of the Japanese occult. 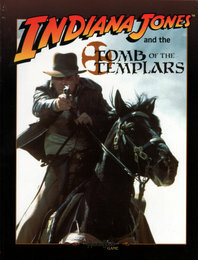 "The first movie in the now-legendary Indiana Jones series finally has its roleplaying game companion. 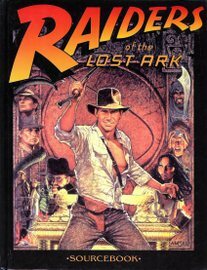 Journey from the jungles of Peru to the Desert wastes of Egypt; investigate a hidden Nazi sub-base or search the dusty stacks of Marshall College's archaeological library -- and, all the while, dodge Nazi bullets, swing over deadly pit traps, and remember to keep your hat on! 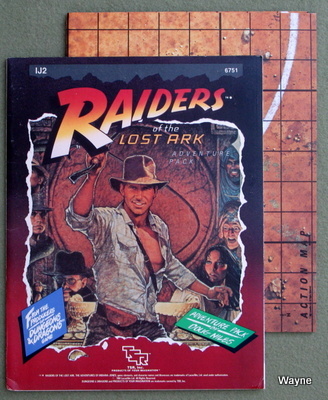 The Raiders of the Lost Ark Sourcebook supplies gamemasters and players with invaluable information concerning The World of Indiana Jones and chronicles the sites, events, and personalities featured in the movie. Background information, never before-revealed historical notes, and detailed maps accompany nearly every description or movie adaptation. 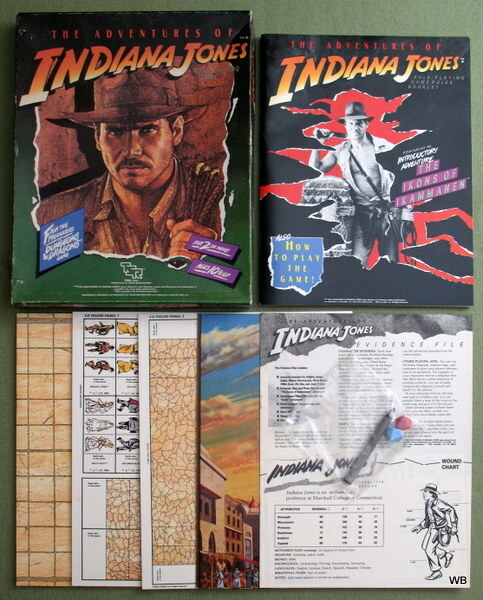 Plus, all the statistics and game mechanics needed for use with The World of Indiana Jones roleplaying game! 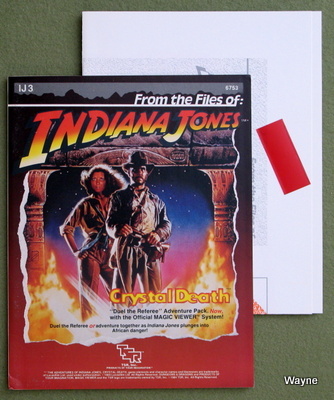 Also included in this supplement is a complete Indiana Jones solo adventure -- an excellent introduction to the The World of Indiana Jones for beginners and veteran roleplayers alike!" "When the Knights Templar fled France in the 14th century, they took their treasure with them. A treasure so powerful -- so deadly -- so evil that it was locked away from the sight of mankind. Now a race has begun to find this mysterious treasure before it falls into the wrong hands. But finding it will be the easy part. Surviving it is the problem. 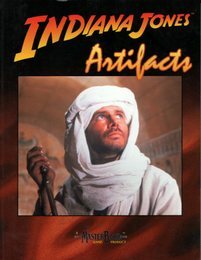 And all of this is only the beginning -- this first adventure/source material collection for The World of Indiana Jones also contains Indiana Jones and the Druid's Curse and Indiana Jones and the Sword in the Stone. Three harrowing, action-packed adventures to satisfy your appetite for thrills!" "Adventure waits everywhere, especially when you're traveling with Indiana Jones. Visit Europe, the Middle East, South America and the Orient, stopping in exciting cities and mysterious places, and finding danger and drama all along the way. Indiana Jones and the Lands of Adventure invites you to travel the globe, and gives you the tools to do it. Loaded with sites, settings and adventure hooks, as well as generic locations you can incorporate into your campaign, characters shouldn't leave home without it." "Watch the fog roll in over the bay. Take a stroll down busy Market Street. Explore the streets of Chinatown, Mingle with the many people on Fisherman's Wharf. See all of the sights that San Francisco has to offer in this book ... but be prepared to experience exciting adventures and solve puzzling mysteries along the way. 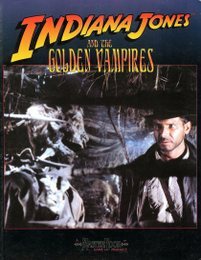 Indiana Jones and the Golden Vampires contains useful information for planning adventures in a new location — San Francisco. Not only is there an adventure inside that will introduce both the gamemaster and the players to this exciting city, but there are three more action-packed adventures as well that will provide even more excitement. So, if you're looking for a good place to base a campaign, look no further. San Francisco is your gateway to adventure!" 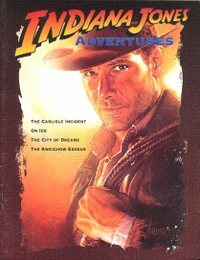 "Join famed archaeologist and adventurer Indiana Jones as he travels the Orient! Visit the decadent pleasure palaces of Shanghai, the mystical villages of India, and the majestic castles of the independent Asian provinces. 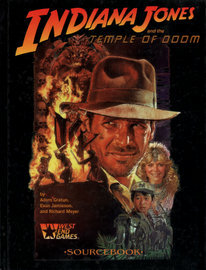 The Temple of Doom Sourcebook explores the sites, characters, and events of the second movie in the legendary Indiana Jones series, providing never-before-revealed facts of Indy's Asian journey. Plus, two complete adventures bring characters right into the action, allowing gamemasters to easily incorporate the cultists, gangsters, and mysterious forces of the Orient into their campaigns." "Archaelolgists, historians, and treasure hunters have long sought the ancient artifacts of the world. But many who ventured too close to such treasures never returned from their quests, for they fell victim to dense jungles, fanatic cults, or strange, muystical forces. Recently, however, the journal of one such archaeologist has been unearthed, and its secrets are revealed here for the first time. Each artifact's entry contains its description, value, last known location, history, and powers. 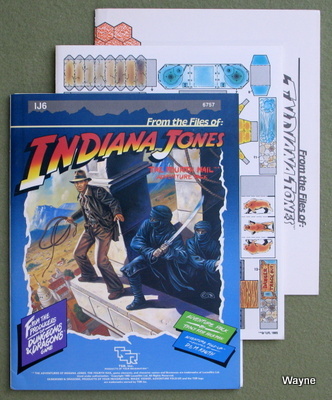 In addition, the gamemaster will find a list of parties currently seeking the artifact, rumors and legends concerning its whereabouts, and adventure ideas for integrating it into a campaign..."
These are the perils at the heart of three Indiana Jones novels - Indiana Jones and the Sky Pirates, Indiana Jones and the Peril at Delphi, and Indiana Jones and the Unicorn's Legacy - and now you can relive the adventures. Between these covers you'll find all the characters from these stories, allies and enemies, ready to be dropped into your campaign; fascinating locations; new artifacts; and adventure hooks. Also included are two full-length adventures and tips on panning novels and movies for roleplaying gold." "Join Alan Mauberg's expedition to track down eminent anthropologist Dr. Adrian Braidtwaite, lost in darkest Africa while researching shamanistic and spiritual phenomena. Learn of mysterious magical and mystical forces, methods for shaping this energy to accomplish specific feats, and other secrets of the deep jungle that have yet to escape into the civilized world."